In an ominous sign for U.S. retailers and the economy as a whole, American Research Group, Inc.'s 2008 holiday shopping survey shows that "... Shoppers around the country say they are planning to spend an average of $431 for gifts this holiday season, down from $859 last year... 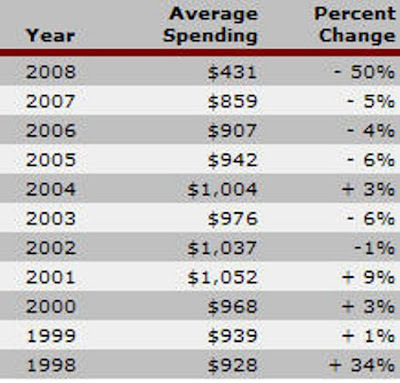 The overall average planned spending is down almost 50% from 2007 and it is the lowest level of planned spending recorded by the American Research Group since 1991 ..."
Hmm, this blogger's household seems to be rather counter-cyclical - paying off all credit cards when others were racking up charges, a home purchase Q1 of 2007, a car purchase this month, plans for robust Christmas spending (mostly on a nice trip), etc., etc.